Some Black Power adherents believed in Black autonomy, with a variety of tendencies such as black nationalism, and black separatism. Such positions were for the most part in direct conflict with those of leaders of the mainstream Civil Rights Movement, and thus the two movements have often been viewed as inherently antagonistic. However, certain groups and individuals participated in both civil rights and black power activism. Not all Black Power advocates were in favor of black nationalism and black separatism. While Stokely Carmichael and SNCC were in favor of black nationalism, organizations such as the Black Panther Party for Self-Defense were not. Though they considered themselves to be at war with a power structure that was indeed mostly white, they were not at war with all whites, merely the individuals in the existing power structure, who happened to mostly be white. Internationalist offshoots of black power include African Internationalism, pan-Africanism, black nationalism, and black supremacy. The movement for Black Power in the U.S. came during the Civil Rights Movement in the 1960s. Many members of SNCC, among them Stokely Carmichael (later Kwame Ture), were becoming critical of the nonviolent approach to confronting racism and inequality—articulated and practiced by Martin Luther King, Jr., the NAACP and other moderates—and rejected desegregation as a primary objective. Those who profess to favor freedom, and yet depreciate agitation, are men who want crops without plowing up the ground. They want rain without thunder and lightning. They want the ocean without the awful roar of its many waters. …Power concedes nothing without demand. It never did and it never will. Civil Rights leaders also believed in agitation, but most did not believe in physically violent retaliation. Although the concept remained imprecise and contested and the people, who used the slogan ranged from businesspeople who used it to push black capitalism to revolutionaries who sought an end to capitalism, the idea of Black Power exerted a significant influence. It helped organize scores of community self-help groups and institutions that did not depend on Whites. It was used to force black studies programs at colleges, to mobilize black voters to elect black candidates, and to encourage greater racial pride and self-esteem. Though the Black Power movement did not immediately remedy the political problems faced by African Americans in the 1960s and 1970s, the movement did contribute to the development of black politics both directly and indirectly. As a contemporary of and successor to the Civil Rights Movement, the Black Power movement created, what sociologist Herbert H. Haines refers to as a “positive radical flank effect” on political affairs of the 1960s. Though the nature of the relationship between the Civil Rights Movement and the Black Power movement is contested, Haines’ study of the relationship between black radicals and the mainstream civil rights movement indicates that Black Power generated a “crisis in American institutions which made the legislative agenda of ‘polite, realistic, and businesslike’ mainstream organizations” more appealing to politicians. In this way, it can be argued that the more strident and oppositional messages of the Black Power movement indirectly enhanced the bargaining position of more moderate activists. Black Power activists approached politics with vitality, variety, wit, and creativity that shaped the way future generations approached dealing with America’s societal problems (McCartney 188). These activists capitalized on the nation’s recent awareness of the political nature of oppression, a primary focus of the Civil Rights Movement, developing numerous political action caucuses and grass roots community associations to remedy the situation. The National Black Political Convention, held March 10–12, 1972, was a significant milestone in black politics of the Black Power era. Held in Gary, Indiana, a majority black city, the convention included a diverse group of black activists, although it completely excluded whites. The convention was criticized for its racial exclusivity by Roy Wilkins of the NAACP, a group that supported integration. The delegates created a National Black Political Agenda with stated goals including the election of a proportionate number of black representatives to Congress, community control of schools, national health insurance, etc. Though the convention did not result in any direct policy, the convention advanced goals of the Black Power movement and left participants buoyed by a spirit of possibility and themes of unity and self-determination. A concluding note to the convention, addressing its supposed idealism, read: “At every critical moment of our struggle in America we have had to press relentlessly against the limits of the ‘realistic’ to create new realities for the life of our people. This is our challenge at Gary and beyond, for a new Black politics demands new vision, new hope and new definitions of the possible. Our time has come. These things are necessary. All things are possible.” Though such political activism may not have resulted in direct policy, they provided political models for later movements, advanced a pro-black political agenda, and brought sensitive issues to the forefront of American politics. In its confrontational and often oppositional nature, the Black Power movement, started a debate within the black community and America as a nation over issues of racial progress, citizenship, and democracy, namely “the nature of American society and the place of the African American in it.”. The continued intensity of debate over these same social and political issues is a tribute to the impact of the Black Power movement in arousing the political awareness and passions of citizens. Due to the negative and militant reputation of such auxiliaries as that of the Black Panther Party, many people felt that this movement of “insurrection” would soon serve to cause discord, and disharmony through the entire U.S. Even Stokely Carmichael stated, “When you talk of Black Power, you talk of building a movement that will smash everything Western civilization has created.” Though Black Power at the most basic level refers to a political movement, the psychological and cultural messages of the Black Power movement, though less tangible, have had perhaps a longer lasting impact on American society than concrete political changes. Indeed, “fixation on the ‘political’ hinders appreciation of the movement’s cultural manifestations and unnecessarily obscures black culture’s role in promoting the psychological well being of the Afro-American people.”. States William L. Van Deburg, author of A New Day in Babylon, “movement leaders never were as successful in winning power for the people as they were in convincing people that they had sufficient power within themselves to escape ‘the prison of self-deprecation’” Primarily, the liberation and empowerment experienced by African Americans occurred in the psychological realm. The movement uplifted the black community as a whole by cultivating feelings of racial solidarity, often in opposition to the world of white Americans, a world that had physically and psychologically oppressed Blacks for generations. Through the movement, Blacks came to understand themselves and their culture by exploring and debating the question, “who are we?” in order to establish a unified and viable identity. Throughout the Civil Rights Movement and black history a tension has existed between those wishing to minimize and maximize racial difference. W.E.B. Du Bois and Martin Luther King Jr. often attempted to deemphasize race in their quest for equality, while those advocating for separatism and colonization emphasized an extreme and irreconcilable difference between races. The Black Power movement largely achieved an equilibrium of “balanced and humane ethnocentrism.” The impact of the Black Power movement in generating valuable discussion about ethnic identity and black consciousness manifests itself in the relatively recent proliferation of academic fields such as American studies, Black Studies, and Africana studies in both national and international institutions. The respect and attention accorded to African Americans’ history and culture in both formal and informal settings today is largely a product of the movement for Black Power in the 1960s and 1970s. Black Power got a foothold in Britain when Carmichael came to London in July 1967 to attend the Dialectics of Liberation Congress. As well as his address at the Congress, he also made a speech at Speakers’ Corner. At that time there was no Black Power organization in Britain although there was Michael X’s Racial Adjustment Action Society. However this was more influenced by the visit of Malcolm X in that year. Michael X also adopted Islam at this stage, whereas Black Power was not organised around any religious confession. The Black Power Manifesto was launched on 10 November 1967, published by the Universal Coloured People’s Association. Obi Egbuna, the spokesperson for the group, claimed they had recruited 778 members in London during the previous seven weeks. In 1968 Egbuni published Black Power or Death. He was also active with CLR James and Calvin Hernton in the Antiuniversity of London,set up following the Dialectics of Liberation Congress. The cultivation of pride in the African-American race was often summarized in the phrase “Black is Beautiful”. The phrase is rooted in its historical context, yet the relationship to it has changed in contemporary times. “I don’t think it’s ‘Black is beautiful’ anymore. It’s ‘I am beautiful and I’m black.’ It’s not the symbolic thing, the afro, power sign… That phase is over and it succeeded. My children feel better about themselves and they know that they’re black,” stated a respondent in Bob Blauner’s longitudinal oral history of U.S. race relations in 1986. The outward manifestations of an appreciation and celebration of blackness abound: black dolls, natural hair, black Santas, models and celebrities that were once rare and symbolic have become commonplace. The “Black is beautiful” cultural movement aimed to dispel the notion that black people’s natural features such as skin color, facial features and hair are inherently ugly. John Sweat Rock was the first to coin the phrase “Black is Beautiful”, in the slavery era. The movement asked that men and women stop straightening their hair and attempting to lighten or bleach their skin. The prevailing idea in American culture was that black features are less attractive or desirable than white features. The movement is largely responsible for the popularity of the Afro. Most importantly, it gave a generation of African Americans the courage to feel good about who they are and how they look. The Black Power movement produced artistic and cultural products that both embodied and generated pride in “blackness” and further defined an African-American identity that remains contemporary. 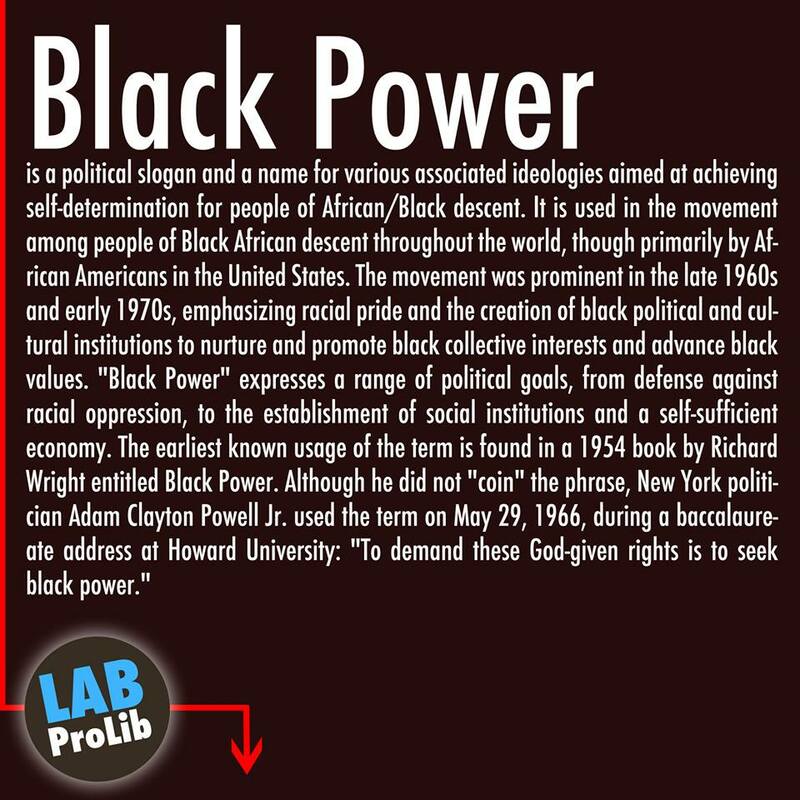 Black Power is often seen as a cultural revolution as much as a political revolution, with the goal of celebrating and emphasizing the distinctive group culture of African Americans to an American society that had previously been dominated by white artistic and cultural expressions. Black power utilized all available forms of folk, literary, and dramatic expression based in a common ancestral past to promote a message of self-actualization and cultural self-definition. The emphasis on a distinctive black culture during the Black Power movement publicized and legitimized a culture gap between Blacks and Whites that had previously been ignored and denigrated. More generally, in recognizing the legitimacy of another culture and challenging the idea of white cultural superiority, the Black Power movement paved the way for the celebration of multiculturalism in America today. The cultural concept of “soul” was fundamental to the image of African-American culture embodied by the Black Power movement. Soul, a type of “in-group cultural cachet,” was closely tied to black America’s need for individual and group self-identification. A central expression of the “soulfulness” of the Black Power generation was a cultivation of aloofness and detachment, the creation of an “aura or emotional invulnerability,” a persona that challenged their position of relative powerlessness in greater society. The nonverbal expressions of this attitude, including everything from posture to handshakes, were developed as a counterpoint to the rigid, “up-tight” mannerisms of white people. Though the iconic symbol of black power, the arms raised with biceps flexed and clenched fists, is temporally specific, variants of the multitude of handshakes, or “giving and getting skin,” in the 1960s and 1970s as a mark of communal solidarity continue to exist as a part of black culture. Clothing style also became an expression of Black Power in the 1960s and 1970s. Though many of the popular trends of the movement remained confined to the decade, the movement redefined standards of beauty that were historically influenced by Whites and instead celebrated a natural “blackness.” As Stokely Carmichael said in 1966, “We have to stop being ashamed of being black. A broad nose, thick lip and nappy hair is us and we are going to call that beautiful whether they like it or not.” “Natural” hair styles, such as the Afro, became a socially acceptable tribute to group unity and a highly visible celebration of black heritage. Though the same social messages may no longer consciously influence individual hair or clothing styles in today’s society, the Black Power movement was influential in diversifying standards of beauty and aesthetic choices. The Black Power movement raised the idea of a black aesthetic that revealed the worth and beauty of all black people. In developing a powerful identity from the most elemental aspects of African-American folk life, the Black Power movement generated attention to the concept of “soul food,” a fresh, authentic, and natural style of cooking that originated in Africa. The flavor and solid nourishment of the food was credited with sustaining African Americans through centuries of oppression in America and became an important aid in nurturing contemporary racial pride. Black Power advocates used the concept of “soul food” to further distinguish between white and black culture; though the basic elements of soul food were not specific to African-American food, Blacks believed in the distinctive quality, if not superiority, of foods prepared by Blacks. No longer racially specific, traditional “soul foods” such as yams, collard greens, and deep-fried chicken continue to hold a place in contemporary culinary life. The Black Arts Movement or BAM, founded in Harlem by writer and activist Amiri Baraka (born Everett LeRoy Jones), can be seen as the artistic branch of the Black Power movement. This movement inspired black people to establish ownership of publishing houses, magazines, journals and art institutions. Other well-known writers who were involved with this movement included Nikki Giovanni; Don L. Lee, later known as Haki Madhubuti; Sonia Sanchez; Maya Angelou; Dudley Randall; Sterling Plumpp; Larry Neal; Ted Joans; Ahmos Zu-Bolton; and Etheridge Knight. Several black-owned publishing houses and publications sprang from the BAM, including Madhubuti’s Third World Press, Broadside Press, Zu-Bolton’s Energy Black South Press, and the periodicals Callaloo and Yardbird Reader. Although not strictly involved with the Movement, other notable African-American writers such as novelists Ishmael Reed and Toni Morrison and poet Gwendolyn Brooks can be considered to share some of its artistic and thematic concerns. BAM sought “to link, in a highly conscious manner, art and politics in order to assist in the liberation of black people”, and produced an increase in the quantity and visibility of African-American artistic production. Though many elements of the Black Arts movement are separate from the Black Power movement, many goals, themes, and activists overlapped. Literature, drama, and music of Blacks “served as an oppositional and defensive mechanism through which creative artists could confirm their identity while articulating their own unique impressions of social reality.” In addition to acting as highly visible and unifying representations of “blackness,” the artistic products of the Black Power movement also utilized themes of black empowerment and liberation. For instance, black recording artists not only transmitted messages of racial unity through their music, they also became significant role models for a younger generation of African Americans. Updated protest songs not only bemoaned oppression and societal wrongs, but utilized adversity as a reference point and tool to lead others to activism. Some Black Power era artists conducted brief mini-courses in the techniques of empowerment. In the tradition of cultural nationalists, these artists taught that in order to alter social conditions, Blacks first had to change the way they viewed themselves; they had to break free of white norms and strive to be more natural, a common theme of African-American art and music. Musicians such as the Temptations sang lyrics such as “I have one single desire, just like you / So move over, son, ‘cause I’m comin’ through” in their song “Message From a Black Man,” they expressed the revolutionary sentiments of the Black Power movement. By breaking into a field typically reserved for white Americans, artists of the Black Power era expanded opportunities for current African Americans. “Today’s writers and performers,” writes William L. Van Deburg, “recognize that they owe a great deal to Black Power’s explosion of cultural orthodoxy”.